When Eric smashes Percy's pot of prize pansies, he tries to get away with it. But when none of his tactics work, Eric says sorry. His father pays for a new pot and Eric learns that grace is epic. This fun, rhyming storybook introduces young children to the biblical concept of grace and teaches them to say sorry. Dai Hankey is a Welsh church-planting pastor who's also a DJ and rapper. The "Eric says…" books use his rapping gifts to create fun, punchy stories that young children will love to listen to. 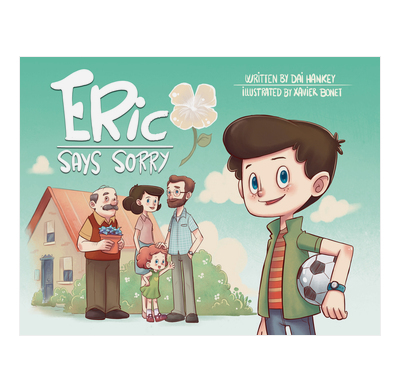 Combined with stunning new artwork by Xavier Bonet, Eric says sorry will quickly become a firm favorite with young children. 11.5" x 8.7" x 0.2"
As a father of four grown children, a resource like "Eric Says Sorry" would have been so useful to share the good news of God's grace with my then small children. With simplicity, clarity and grace, Dai and Xavier do just that. The simple story-line and drawings will make it easy for any parent to engage in helpful conversations with their child. As a parent of young children, the unfolding of Eric's story is all-too-familiar. But there's a twist that turns his predicament on its head! Grace is clearly explained, demonstrated, and applied. Kids and parents will appreciate this colorful and creative lesson on forgiveness and grace. We love reading to our kids – and all the more when it’s one of those rare books, like this one, that combines four elements: the right length, good rhyme and illustrations, and significant soul-shaping truth. We’re eager for every good help we can get not only to teach our kids to say sorry, but also to feel the force, beauty, and cost of God’s "undeserved kindness when we’ve been bad." "My daughter loved the rhyming"
This is my favourite of the Eric says series. The series is lovely to look at and easy to give away (all mums think they want to teach their kids to say sorry, thank you and please). We used the books in story time the last 3 weeks of term then gave away the sorry books for children leaving for school. The sorry book clearly points to the gospel so great to give away. The books are probably best for age 4 years and up as quite long for little ones. I loved this book so much I bought 10! One each for our child care centres! And I never get sick of reading it, I still get teary at the end. I wish we could read it to all adults too! I don't normally write reviews, but this book has God's hand all over it! When Eric makes a mistake, he tries to hide it, then blame others. It's not until there is no more escape that he finally admits he is wrong and then goes about repairing the damage. He can't afford it, but he tries to, and Dadda comes through with the goods. This book is a biblical portrayal in simple terms the true meaning of repentance. Not just in words, but deeds. Acts 26:20 b "They should repent and turn to God, performing deeds in keeping with their repentance." Loved it!! This book explains the difficult concept of Grace in a very accessible format for kids and adults. It uses saying 'sorry' - something we all need to learn in a very funny way and the fact that it is a rhyming story with rhythm is great. The illustrations are good too. I particularly like Eric trying to glue the pansy's back together again and him discovering that Grace is epic!! My five-year-old daughter was gripped by this story. She was able to relate to Eric and his mistake and how he tries to cover it up and blame others. The story then moves on as Eric’s Dad shows him kindness and points Eric in turn to God’s grace. This book teaches children about honesty, about saying sorry and points to God’s kindness in Jesus. It is well illustrated and the language is generally clear and simple. The book provides a good starting point to help children think about sin and grace. Suitable for 3-7s. I have just watched the dramatised reading of this book. It is a wonderful illustration of how grace works for both the young and no-so young. In addition it helps children understand the importance of honesty, not blaming others, confession and the joy of being forgiven. Dai's use of poetry and contemporary vocabulary gives a real sense of pace and relevance. I look forward to seeing the book itself and will be ordering copies for the younger children in Sunday School for Christmas this year! A really accessible book for children about grace. My 5-year-old-son read it first and when I asked him if Eric said sorry in the end, he said, "Yes, and his Dad taught him about grace." The scene featuring Eric and his family will be all-too familiar to most parents: one child is guilty; the other is trying to stir up the trouble. I was very moved reading it to my children, and pray that it will help them to understand the importance of truthfulness and confession, and also the wonderful gift of free-to-us-but-not-to-Him-grace.